Promote your business or event when you use affordable flags and banners from AttentionFlag.com. Our business provides a wide array of solid color flags, including our three-panel tall banner flags. Our selections are made using our high-end 200 denier UV-coated nylon made in the US. As always, we perform all sewing to the highest market standards. 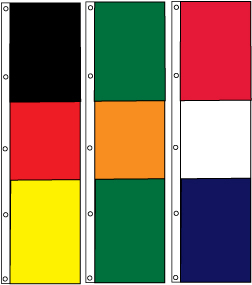 Our 3-panel tall flags feature double needle lock stitching, reinforced fly ends, a canvas heading, and brass grommets. Pick any 3 stock colors for your flags!